Roses, roses, roses. Valentine flowers are everywhere in every town, online, and now even on Amazon who are promoting flowers from “their farms”. Such a word mockery. We too could put a slippery edge on advertising conversationally, as my farm is one that I choose to buy from. Humph. All these Valentine offerings are mainstream and ordinary; from the same South American & African farms, in the same colors, cut the same time, and wrapped ever so common in the same plastic. So…the only difference is a sliding scale of size and price grabbing. Seriously m Seriously my dears, do you think of your most precious person as mainstream or mediocre? Take a lesson from history before things became so ordinary. First, by most accounts there were many Saints named Valentine but the day has been a lovers holiday since the 14th century with the help of Chaucer. His sultry poem, The Parliament of Birds refers to February 14 as a day for birds & humans to find a mate. It seems both Chaucer and Saint Valentine found flowers to convey their feelings; and they weren’t roses. Due to the 19th century Language of Flowers mania; roses became the summer gift of Victorian choice obviously for their meaning of affection. However, June is the rose month not February as neither in the British Isles nor the United States are they in season unless greenhouse grown. Sweet peas-Tulips-Forget-me-nots? What better Valentine flowers than those named such and yet where are they amid the mainstream. Gardenias; this incomparable and lovely scented flower is the epitome of grace and what outlet have you seen them lately? No, you will not see them because they are not a commodity product able to be quickly and cheaply grown in mass. Nothing good is ever easy and these flowers require patience and space to grow their beauty which is not a plus for the foreign farms. See our Valentine’s Day menu of sweet pea and forget-me-not bouquets, tulip bunches and baskets, gardenia bowls and wearable’s, and always birds of all feather for accent. If you must have a rose or two in your bouquet, our Victorian Tussie Mussies made to order and according to the Language of Flowers is charming. Each comes complete with a vintage, secret message tag and decorative box. 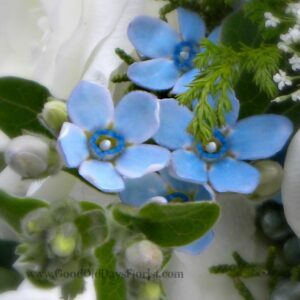 And about those forget-me-nots? We found a twin in a little known California flower that is just as bright and just as blue. Do you want a unique or ordinary gift of flowers? Think about it and call us. These all are US grown and in limited supply so don’t think too long; reserve yours now for Valentine’s Day.